Find an Authorized OSHA Trainer – Coming Soon! 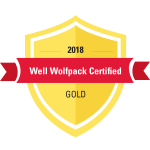 NOTE: WorkSafeBC is the Workers’ Compensation Board of British Columbia, so keep in mind that any mention of requirements refers to the Occupational Health and Safety Regulation in Canada. Find an Authorized OSHA Trainer – Coming in January! In January, we will launch a new public search and listing website so that anyone looking for OSHA 10-hour and 30-hour Outreach classes can easily find and contact trainers who are authorized through the Southeastern OTI Education Center. But, there’s a catch! Trainers must opt in and give permission to be listed on the website. When the new website is available, we will contact all trainers and provide directions on how to be listed on the site. With our own listing website, we can ensure that information is current and accurate, with the added bonus of increasing exposure for Outreach Trainers authorized through our education center. Stay tuned for more details! 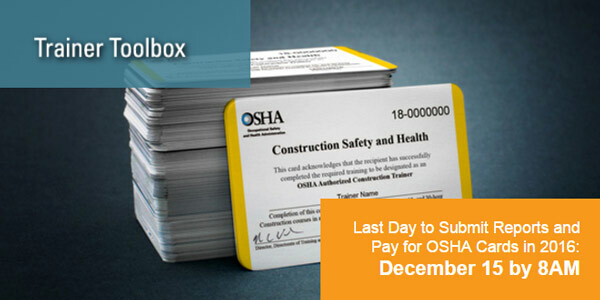 In order to print and mail our final batch of OSHA cards before the holidays, Outreach Trainers must submit their training reports and pay for their OSHA cards no later than December 15 at 8AM. If there are issues or errors on reports, cards may be delayed until early January 2017. Trainers can still continue to submit reports and payments after this date and during the holidays, but our office will be closed December 24 – January 2, and will re-open on January 3. We will address any issues and begin reviewing reports again that week. If you have any questions, please contact us at SoutheasternOTI@ncsu.edu. Teresa Chapman oversees the program administration and compliance for the Southeastern OSHA Training Institute Education Center. In addition, she manages the Manager of Environmental Safety and Health (MESH) Certificate Program and OSHA’s Public Sector Safety & Health Fundamentals Certificate Program. Teresa has over five years of state and local government program administration and outreach experience. She has previously held roles in sales, marketing and event coordination in the private sector.